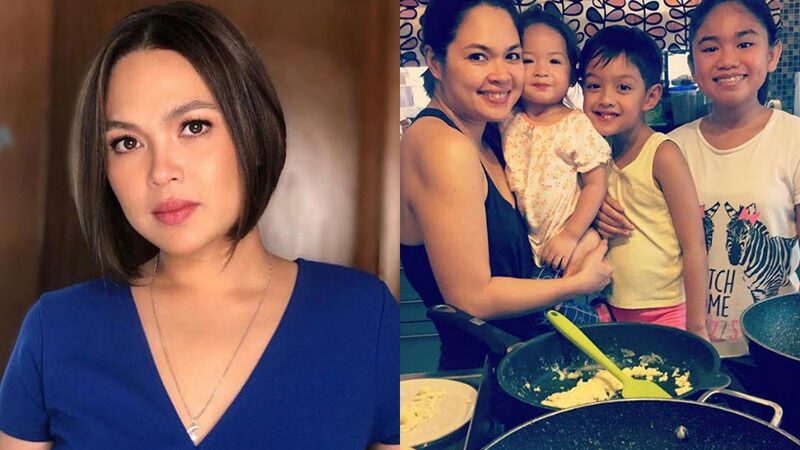 Judy Ann Santos lets her three children--(L-R) Luna, Lucho, and Yohan--use gadgets, but monitors the websites they click. Is it possible for kids to be gadget-free these days? Judy Ann Santos and Ryan Agoncillo think that having devices such as laptops, tablets, and cellphones is inevitable, so instead of keeping their kids away from them, their approach is to teach them how to use it properly. In 2016, Yohan and Lucho were allowed to use iPad for their research. Fast forward to 2019, the rules have been slightly modified. Lucho, 8, can now view videos that interest him. In her recent interview with PEP.ph (Philippine Entertainment Portal), she said, "I know naman, all sites, ang pinapanood naman niya ay football and funny videos... I check their history, e."
Luna also gets around two hours of screen time daily, but the actress sees to it that that the little girl has activities that do not require use of gadgets. "With Luna, one hour in the morning, one hour in the afternoon... Naka-filter yung YouTube Kids. But in between those hours, she needs to complete a task in a writing booklet or reading booklet. Basta hindi tablet. "Dapat may iba siyang activity ginagawa na hindi konektado sa gadget at all. It's either I bring her to the kitchen, tulungan niya ako magluto. Punta kami sa dollhouse niya o mag-trampoline kami. Basta something hindi talaga konektado." Yohan can use more devices. "She's high school already and she's using my iPad para rin makita ko. Kapag may research siya, she can bring my laptop in her room, use it with her tutor. The 14-year-old teen is also not allowed to have her own social media account until she reaches 18, the legal age. Judy Ann explained, "There are content in this social media thing na baka ikakagulat mo, 'tapos hindi ka pa ready for your age." So far, the rules are strictly followed by the three kids. Juday said, "In fairness naman sa mga anak namin, we're blessed to have kids that are very obedient. Hindi mahirap pagsabihan, hindi sila mahirap bigyan ng rules kasi they listen."